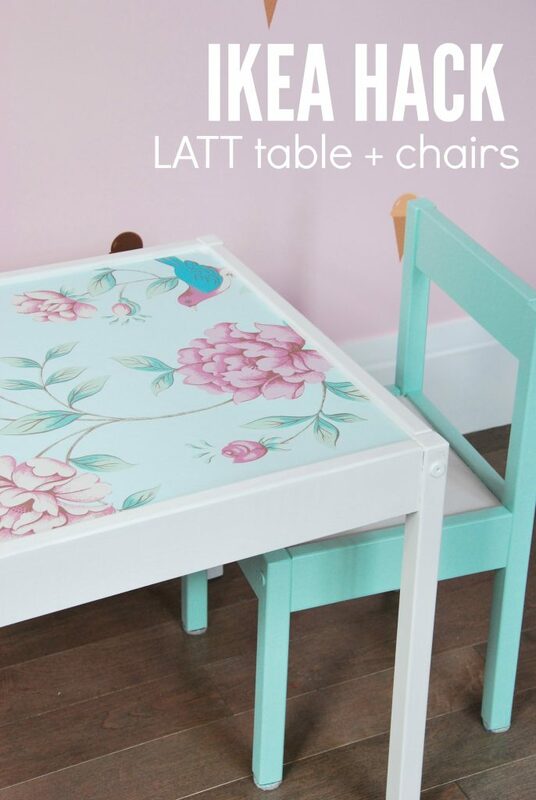 A few weeks ago when I was garage sale-ing, I came across an IKEA “LATT” table and chair (it was missing one chair from the set). 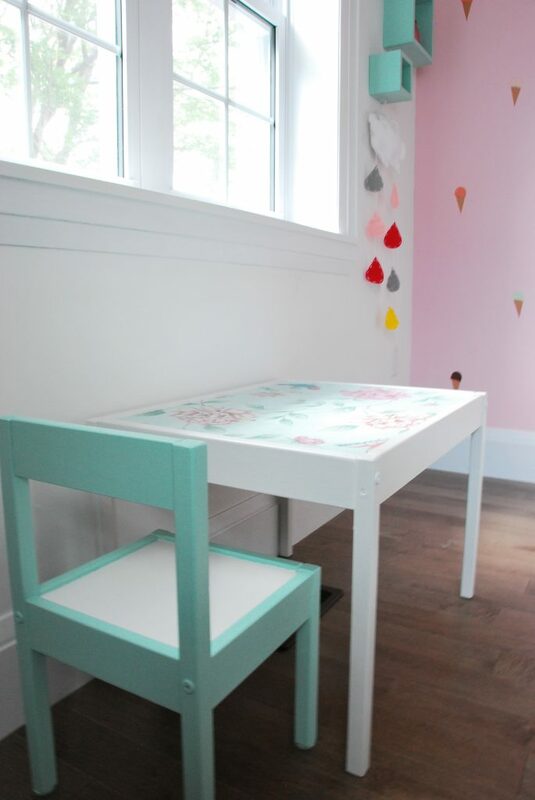 The family was only asking a couple of dollars, and although we already have one table for Maya to draw/craft/play at, I figured it would be nice to have a second (one for her room, one for the main floor). 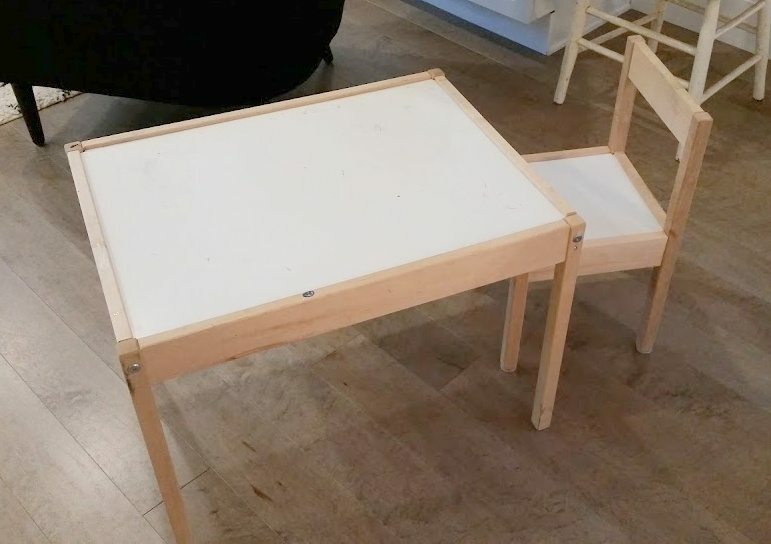 The set was looking pretty worse for wear though, so I knew I would need to pull the old “IKEA hack” on this LATT table…. I had some “Isabelle Blue” wallpaper from Graham & Brown leftover from another project and decided I’d put it to use. So to make the Latt table way more fun, I figured an application of this wallpaper would be amazing. 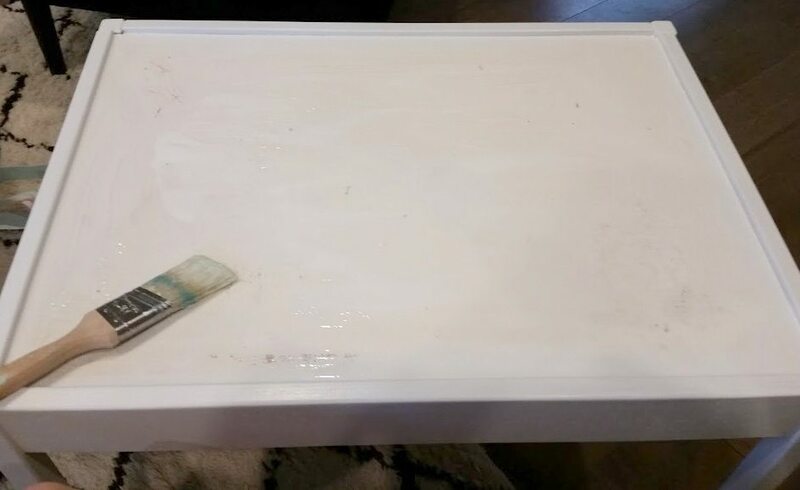 I cleaned up the table, and then gave the wood part a coat of high-gloss white paint. Once that had dried, I got out my paper and a bunch of white glue. I didn’t have any actual Modge Podge on hand, but knew that regular white glue would do the trick. 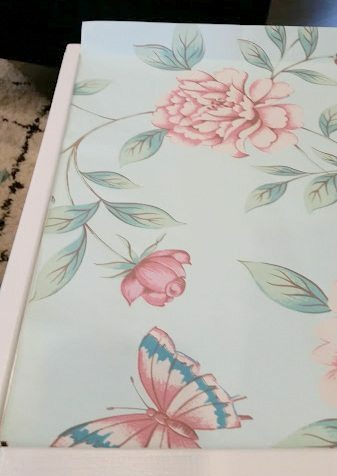 I cut a piece of the wallpaper to be slightly larger than my table. Once placed on the table, I went over the creases with my finger to create a natural bend where the paper needed to be cut. Then I used an exacto knife to get a precise cut with the blade (cut the paper right in place). Another option if you didn’t have an exacto would be to trace where you need to cut with a pencil, and then trim along that line with scissors. Once I had my piece ready, I gave the top of the table a coat of white glue. Make sure to put on enough that your paper is going to adhere well, but not so much that it might be overkill and you won’t be able to smooth out bubbles. I placed the piece of wallpaper down on the table, smoothed out bubbles first with my hand, and then gentle with a credit card, and made sure it was perfectly in place. Once that was done, I applied some white glue on top with a paintbrush, to help seal the paper. Again, don’t do too much at once, as you don’t want it to get too goopy. I did two coats of glue, giving a few hours in between for drying. 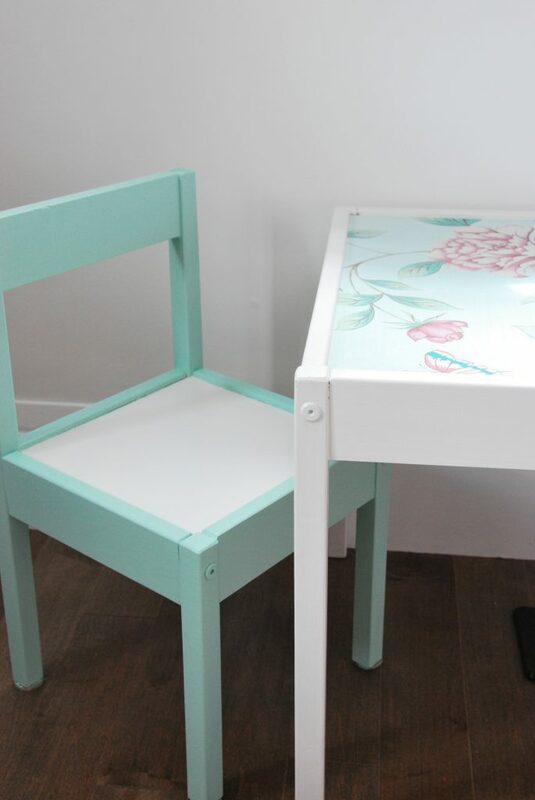 To tie the chair in, I used the same mint coloured paint that has been used elsewhere in Maya’s room (“Baffling Behavior” by PARA paints). It was a good match with the wallpaper, and helped to tie in with the shadow boxes and closet doors. It really works in the space, and so far it’s all been holding up beautifully! The two coats of glue have sealed in the paper well, which obviously was a strong paper to begin with (advantage of using actual wallpaper versus something like wrapping paper). Looks cute, right? The small table and chairs we had in there before, we have moved back downstairs to Maya’s play space on the main floor (where they originally were, anyway). I’m so loving the wallpaper, that my plan is to paper the inside of Maya’s closet in it. And we may also do a bedroom at our family cottage with it as well. It’s really so stunning. Update –> You can check out the full room reveal here!! Urban Walls Decals. 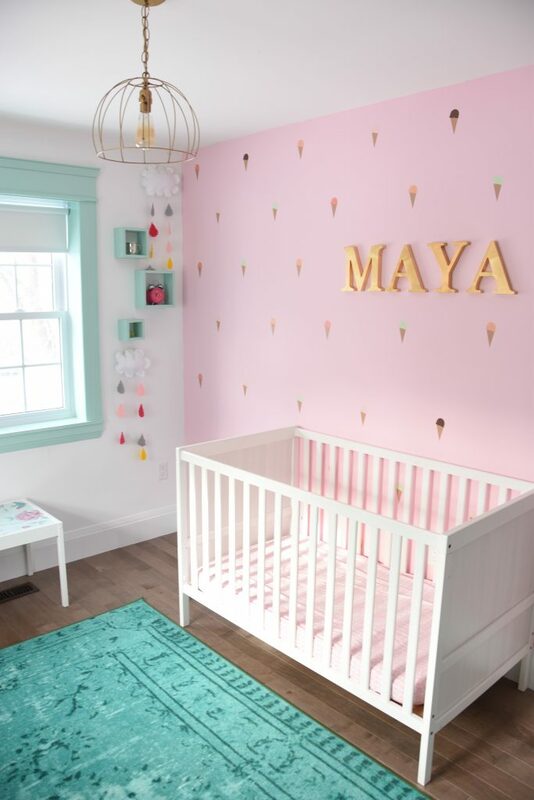 I’m obsessed with all the decals from Urban Walls (which is where I got the ice cream cones for this room)!! 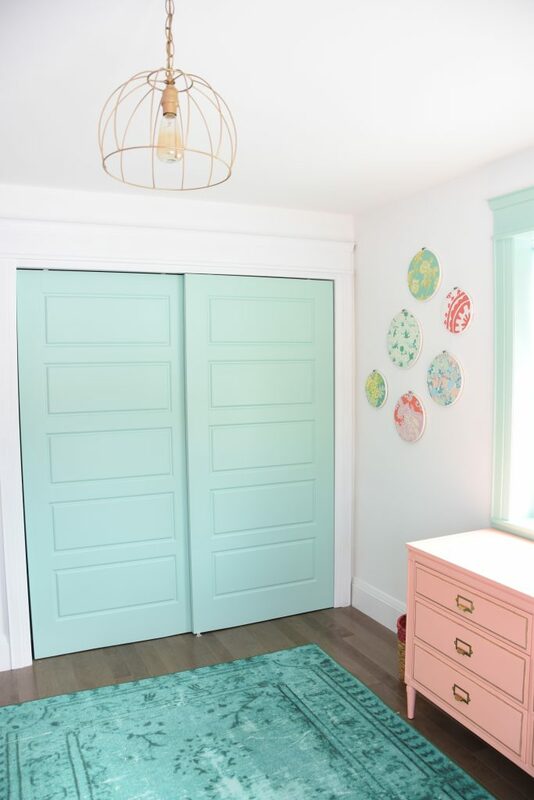 Overdyed Turquoise Rug: Love this style of rug so much. Looks cute but not overly “kid”. White Crib: A classic. You can’t go wrong with white! Ours was a gift, but I love the sweet details on this antique style one. Pink crib sheets. Love these sweet floral ones, and these heart ones. Gold Letters for the Wall. 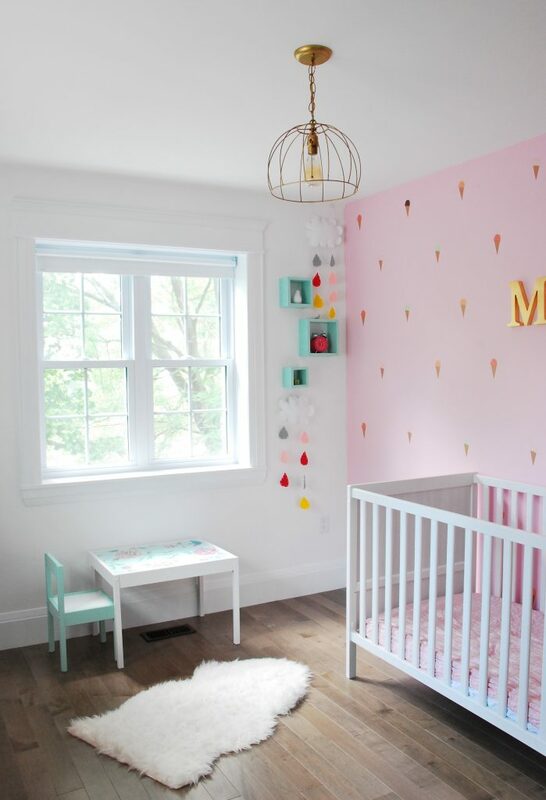 Spell out your kid’s name, or a cute phrase! Gold hardware for dresser. Take an old dresser, paint it, and update the hardware with these cool gold campaign style pulls. Box Shelves for the walls. Use these to put little trinkets inside. Perfect for a different kind of art display! I used these cube ones and painted them mint, but if I had discovered these little house shelves first I would have used them (SO cute!!!). Gold light fixture. Mine was a DIY, but this gold geometric pendant is similar and stunning! 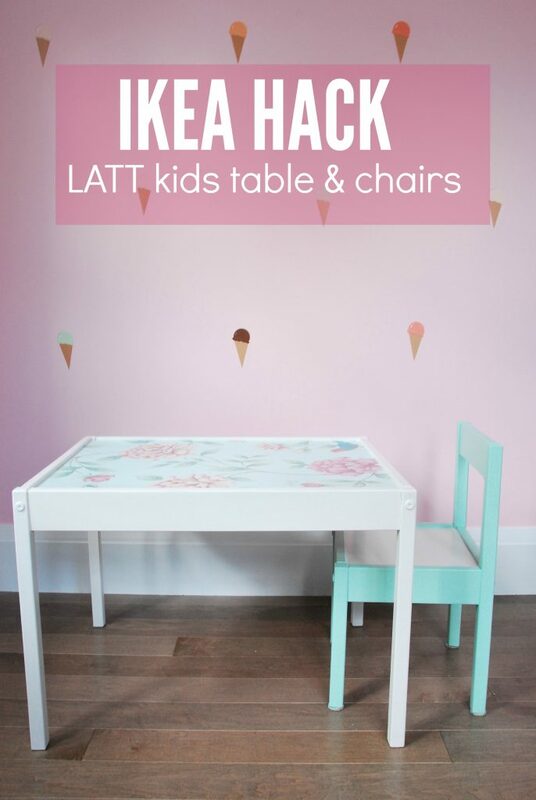 Have you guys done any IKEA hacks? I love taking items that so many people have and putting your own spin on it, you know? Plus when you can score the furniture from garage sales instead of new, even better! Disclosure: Thanks to Graham & Brown for sending that beautiful wallpaper my way to use for this project. All opinions are of course my own! 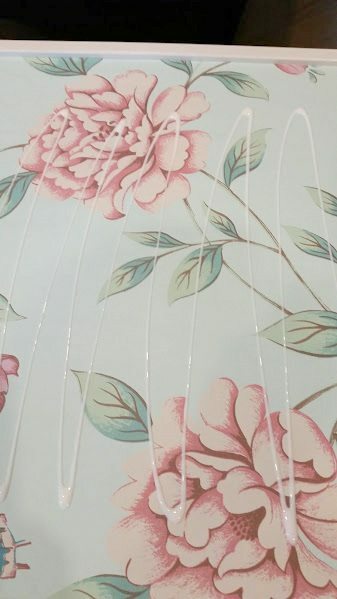 beautiful.. i wonder if you could modge podge fabric onto the top instead of wall paper?